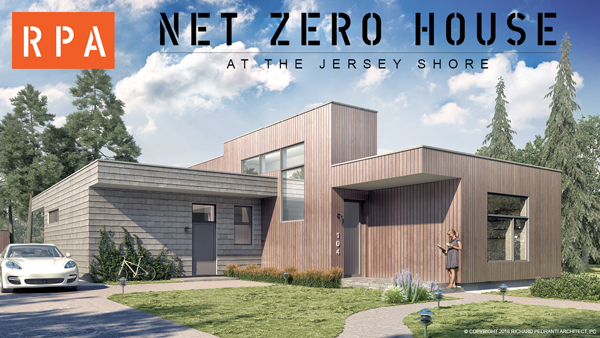 MILFORD, PA and SPRING LAKE HEIGHTS, NJ, July 12th, 2018 – Richard Pedranti Architect (RPA), a full-service architecture firm focused on energy efficient design, has partnered with Blueprint Robotics to deliver a prefabricated Net Zero home at the Jersey Shore. The recently assembled building replaces an existing house in Spring Lake Heights and will serve as a weekend home to a couple from Brooklyn, NY. The new building is a Net Zero Energy building, meaning it produces roughly as much energy as it consumes annually. To significantly reduce the energy required to heat and cool the home, passive house design principles were employed. This includes higher levels of insulation, airtight construction, triple-pane windows, the use of a heat recovery ventilator and passive solar orientation of the home on the building lot. These strategies allow the home to remain comfortable year-round without having a traditional HVAC system. It is anticipated that this home will require less than half of the energy needed to heat and cool a typical American home. 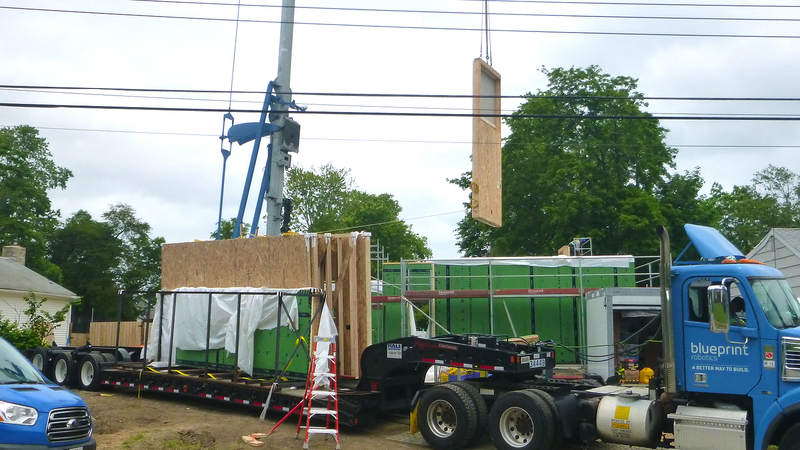 Off-site building systems are a type of prefabrication that allows for greater specialization than other prefab construction techniques. The Blueprint Robotics off-site building system uses high-grade building materials and advanced manufacturing technologies in a controlled factory environment to create quality homes that expressly meet customer needs, while saving both time and money. This modern custom home designed by Richard Pedranti Architect was translated from the firm’s building information modeling (BIM) software into the machine language understood by robotic manufacturing systems. 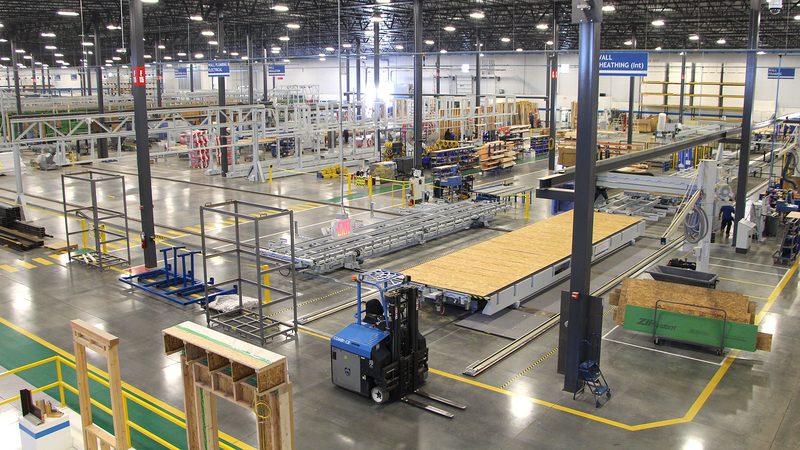 Using those instructions, the machines at the Blueprint Robotics manufacturing facility in Baltimore created panelized pieces of the home that were then transported to New Jersey and assembled at the job site in just three days. In total, the high-efficiency building will take only 3 ½ months to fabricate, assemble and complete. The window installation is now underway with interior features and exterior cladding being added by a local contractor. “RPA transformed our wish list into a beautiful design through a shared belief that functional passive house principles are consistent with a minimalist, modern aesthetic,” remarked homeowner Theresa Lang. This home marks the first project for these partners and the first Net Zero project for Blueprint Robotics. “We are very pleased to partner with Richard and his firm. RPA’s technical expertise and sophisticated design solutions are helping to transform residential architecture.” – Jerry Smalley, CEO Blueprint Robotics. Blueprint Robotics is a group of passionate entrepreneurs who specialize in building, design, off-site construction, and manufacturing. Founded and operated in Baltimore, MD, Blueprint Robotics uses panelized building systems to construct beautiful, customized, and modern homes in a more cost-effective and timely manner compared to traditional construction techniques. To learn more, go to: blueprint-robotics.com.